Is Western Sahara a Sovereign State or Part of Morocco? 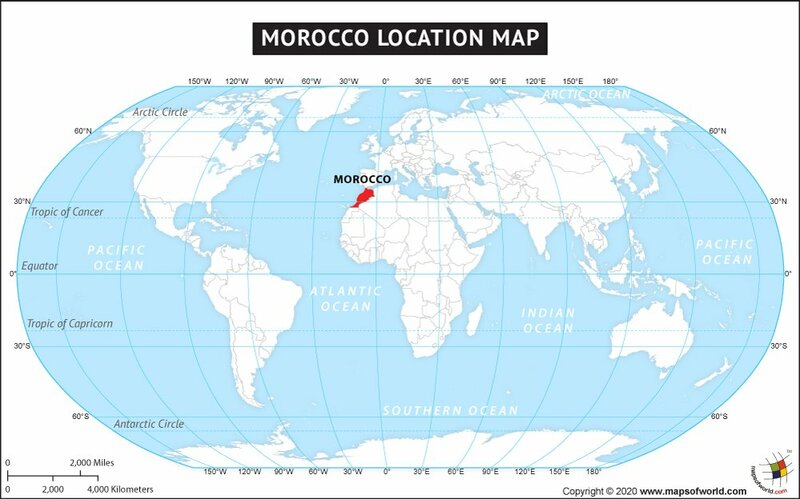 Morocco is a country in northwestern Africa, along the Atlantic Ocean and Mediterranean Sea, as well as the countries of Algeria, Western Sahara which it controls, and Mauritania. The capital of Morocco is Rabat. The flag of Morocco was officially adopted on November 17, 1915. The background of the Morocco flag is red, with a green five-pointed star at its center. The Phoenicians, who came to the region in 1000 BC, were the first people to control the region of Morocco. Other civilizations came, which included the Vandals, the Visigoths, the Byzantine Greeks, and the Romans during 5th century AD. In 681 AD, the Arabs came and complete control over the region took place in 705 AD. Europeans took interest in the region since it had a significant location between Africa and Europe. The first to arrive were the Portuguese in the 15th century, who took control of the Atlantic coast. In the 1800's, France came and by 1904, the United Kingdom officially recognized the region as a sphere of influence of France. It wasn't until 1912 that Morocco became a French protectorate. After World War II, movements for independence became stronger in the region, leading to the creation of the Independence Party. This led France to exile the popular Sultan Mohammed V in 1953, replacing him with Mohammed Ben Aarafa, which made the movement for independence even stronger. In 1955, Mohammed V returned to Morocco and on March 2, 1956, independence was eventually declared. 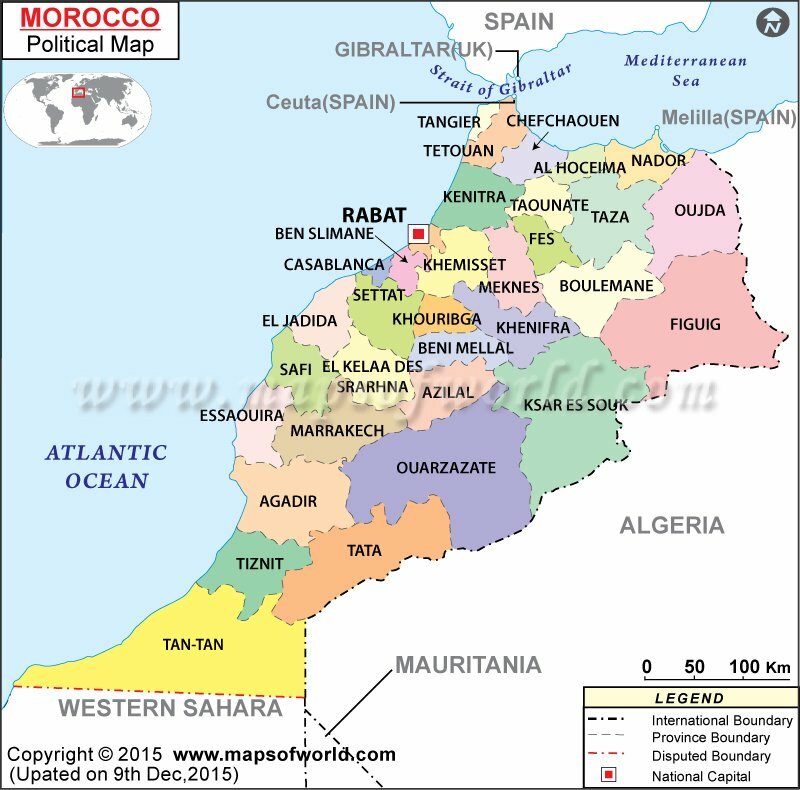 Morocco is located in North Africa along the Mediterranean Sea and the Atlantic Ocean. Its borders are Algeria and the Western Sahara, and shares borders with the Spanish enclaves Ceuta and Melilla. Morocco's northern coast and interior regions are mountainous with the Atlas Mountains located primarily in the middle and southern portions of the country. Morocco's highest point is Jebel Toubkal, with an elevation of 13,665 feet above sea level. Morocco is a parliamentary constitutional monarchy, with the Prime Minister being the head of government and the head of a multi-party system. Executive power is practiced by the government, while legislative power is practiced by the government and its bicameral Parliament. The Parliament consists of the Assembly of Representatives of Morocco and the Assembly of Councilors. Morocco is divided into 15 regions with local administrations and its legal system has its foundations in Islamic Law, including that of France and Spain. Morocco is a popular travel destination in North Africa. Its location offers travelers a wide range of unique experiences that range from the snow-capped Atlas Mountains to the hot climates of the Saharan Desert. Among the most popular things to do and see in Morocco are the historic sites, religious structures, beaches, and eclectic local markets. Marrakech is Morocco's most popular city. It is the country's 4th largest, filled with the perfect combination of modern and historic sites and areas. The city has 2 distinct districts: the Medina with its intertwining passageways and local shops filled with character; and the Gueliz - which is the complete contradiction of the old town with its fast food chains, metropolitan restaurants, and modern buildings. Casablanca is Morocco's largest city and is the main industrial zone of the country. Two places worth visiting are the New Town district - packed with charming French architecture and the Hassan II Mosque, which is the world's 3rd largest and North Africa's largest mosque. Fes contains the most complete medieval city in the entire Arab world. It was Morocco's capital for more than 400 years and today, is still considered as the cultural and religious center of the country. Its old town center with over 9000 narrow streets is a UNESCO World Heritage Site, and its tanneries are well worth a visit. Esaaouira is a favorite among backpackers, as it was made famous in the 60's by Jimi Hendrix, and then by Bob Marley in the 70's, who came to visit for its laid back beach scene. Among the popular things to do in this town are surfing, shopping in its souks, and strolling on the windy beaches. Morocco spends 1/5 of its annual budget on education. Government spending mainly consists of building schools and universities to meet the demands of the growing population. However, education in the country still faces many challenges as only about half of the country's girls attend school and 3/4 of boys do, with numbers being lower in the rural regions. It's also important to note that Morocco has the oldest continuously operational university in the world, which is the University of Al-Karouline established in 859 AD. It is impolite in Morocco to refuse to eat meat when offered. Common greeting involves a peck on both cheeks. The most popular sport in Morocco is soccer and in 1986, their national team became the first Arab and African country to make it to the 2nd leg of the World Cup.